That’s right, the CEO of Loopt will personally clean your house for $5. But only if 1,000 people sign up. Only, I haven’t told him about the deal yet. He may not agree, but I’m using his name anyway. Hell, he doesn’t know I’ve put this offer out there. But that’s what Loopt is doing to popular San Francisco businesses. This “offer” came to me in a Loopt deal email. 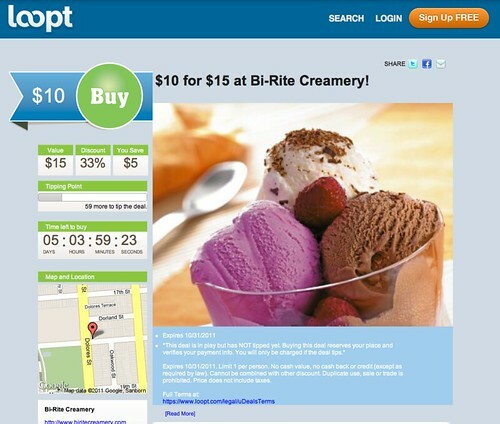 In its bizarre reverse-Groupon model, they are trying to collect demand for businesses. It would be sketchy but sort of acceptable if this were done behind the scenes. But they’re doing it out in the open using the businesses’ brand names with discounts the businesses didn’t agree to. I wrote about the Loopt model the other day. One of the many challenges with Loopt’s u-Deals is that people would want discounts at popular places. Every time I’ve been to Bi-Rite Creamery, there’s been a long line out the door. They don’t need to discount like this. Loopt is using the Bi-Rite name to build its mailing list. They are collecting people’s credit card numbers in conjunction with this purported deal. That is bordering on fraud. I would also consider it trademark infringement. Having to deal with consumers who view it as a real offer. I called Bi-Rite and they said “We have nothing to do with that.” While the fine print implies that it’s not a real deal, to the casual reader it’s very confusing. Bi-Rite reported having turned away other consumers who referenced the deal. Bi-Rite is a premium brand. Being associated with daily deals can dilute that. Long term SEO impact. If “deals” like this manage to rank in search results, it further affects the brand and their ability to charge full price. This entry was posted in mobile, mobile search. Bookmark the permalink. Totally agree…not sure how this ever made it past any kind of product VP / board / etc. I’m pretty sure you just blew up Loopt U-Deals in one day. Nice work. This crowd-sourcing deals is a great idea for Loopt or other DD companies but bad for businesses. I’m glad you have become the “watchdog” of the DD universe. When are you going to take a swing at your buddies at 4square for giving discounts to people that are already in the stores? Cannibalizing there already in-store foot traffic? I’m guessing they have better products up their sleeve but for now, that doesn’t seem like the solution either? Rupert — foursquare provides tools to construct a variety of different offers, including one-time only offers for new guests. (The “Newbie” offer.) Generally, foursquare offers aren’t as generous as those touted by daily deal companies and would be sustainable for businesses that run them. They also don’t have a huge salesforce pushing unsuitable products onto businesses. Could foursquare be improved? Sure. But they’re way better than the daily deal guys. Thanks for the update. I am thoroughly intrigued by foursquare they have an amazing team, but as you know without the tremendous amount of funding they have raised; reaching all these merchants would be impossible as they don’t have any actual revenue. Although, this new Amex parntership is huge and may have solved a lot of those conversations. I am trying to figure out how to create a service that LBS and real-time with smaller discounts, but still effective in “pulling people in” that is not just another foursquare or groupon. I also agree that daily deals in their current form are completely broken. The team’s that figure it outand streamlie the process have an incredible opportunity. The “deal” space will be over by Q1 2012. Nice takedown. What Loopt is doing sounds nice for the consumer on the surface, but in fact is essentially racketeering. They’re bottom-feeders. Hopefully, a spate of trademark infringement suits will bring them to their knees before they do any real damage to anybody. Bi-rite should sue loopt right away. It’s not even a question, this is outright fraud, false advertising and malicious interference with a business. Take these scoundrels down, and put the names of their board members on a black list. This is the same Loopt that sent SMS messages to everyone in your addressbook when you signed up w/out asking, right? How quick everyone was to forgive them for that “accident”. I think you’re overrating the influence of someone or even many people requesting a deal from any given retailer or brand. In fact, it seems to me that a mass request only underpins the demand for the product or service – which is a good thing. The fact that consumers may be clamouring for Ritz Carlton to give them a discount doesn’t reflect poorly on Ritz Carlton. In fact, if they reject the deal, it actually reinforces their premium brand positioning. I think what you’re really missing is that this is the inevitable future of group buying and whether such groups assemble through services like U-Deals or organically isn’t important. Social networks have enabled consumers to organize their buying power and there’s no question that they’ll use it however they can. Most merchants will jump at that chance.